Chinese dumplings are delicious when deep-fried, steamed, or poached, but the tastiest dumplings are a combination of fried and poached: pot stickers. 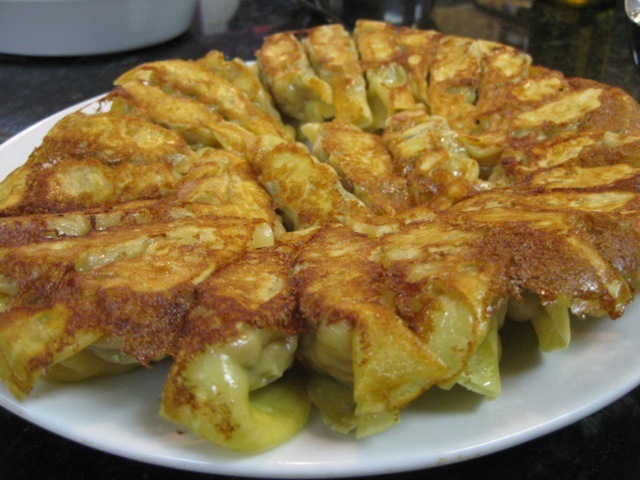 There are several secrets to pot stickers: the filling must be made out of raw protein, a nonstick pan is crucial to keeping the dumpling from actually sticking to the pan, and poaching in chicken stock is much more flavorful than poaching in water. Pot stickers are usually filled with ground pork. A more sophisticated and elegant filling is lobster. And the secret to lobster pot stickers is to use ground raw shrimp as the binder to hold the filling together. When pot stickers cook, the dough wrapper shrinks around the filling and then holds together in a tight bundle. And even though these dumplings are called “stickers,” we don’t really want them to stick to the pot. Want to try your hand at lobster pot stickers? Join us on Sunday, May 13 at 5 pm for “Attention to De-Tail” for an all-lobster cooking class. Blanch the lobster in boiling water for 3 minutes, then chill in an ice water bath. Remove all the meat and chop. Save the tomalley and any coral and add back to the meat. In a food processor, puree the shrimp and egg white. Fold into the lobster meat. Melt the butter and sauté the carrot, celery, and pepper until softened. Remove from heat and add the chives and breadcrumbs. Add to the lobster. Season well. Put a spoonful of the filling (use a #100 size disher) into the wrappers. Brush one edge of the wrapper with water. Fold in half and pinch together to seal. In a nonstick skillet (9-10 inches), heat some sesame oil. Add the pot stickers and cook until they sizzle. Add some stock, cover, and cook for 5 minutes. Remove the lid, let the liquid boil away, then flip the pan over on a serving platter to serve with the browned-side up.